You are currently browsing the archives for the The Voyage Out category. Dead Reckoning 66° 38′. Long. 178° 47′. Made good S. 17 W. 94. C. Crozier 688′. Stayed on deck till midnight. The sun just dipped below the southern horizon. The scene was incomparable. 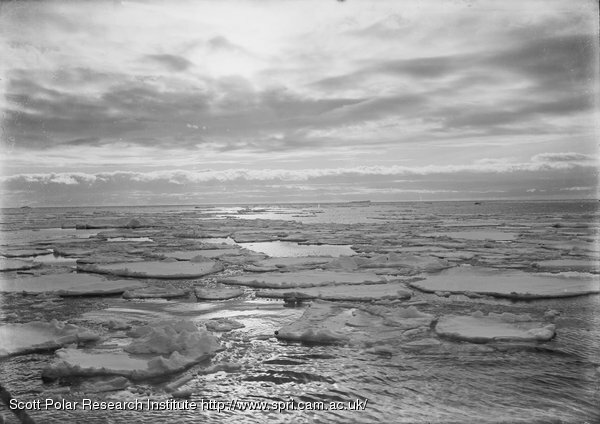 The northern sky was gloriously rosy and reflected in the calm sea between the ice, which varied from burnished copper to salmon pink; bergs and pack to the north had a pale greenish hue with deep purple shadows, the sky shaded to saffron and pale green. We gazed long at these beautiful effects. The ship made through leads during the night; morning found us pretty well at the end of the open water. We stopped to water ship from a nice hummocky floe. We made about 8 tons of water. Rennick took a sounding, 1960 fathoms; the tube brought up two small lumps of volcanic lava with the usual globigerina ooze. 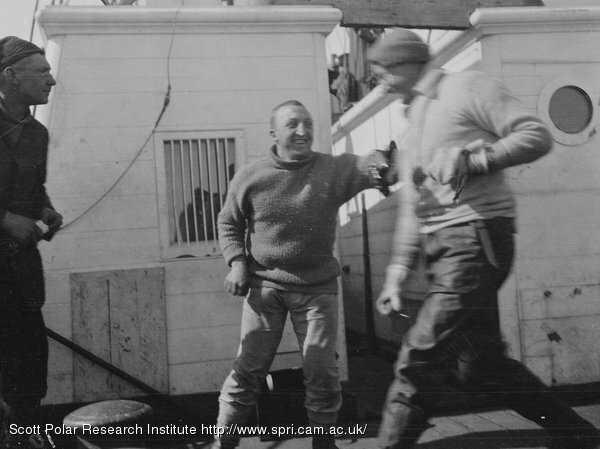 Wilson shot a number of Antarctic petrel and snowy petrel. Nelson got some crustaceans and other beasts with a vertical tow net, and got a water sample and temperatures at 400 metres. The water was warmer at that depth. About 1.30 we proceeded at first through fairly easy pack, then in amongst very heavy old floes grouped about a big berg; we shot out of this and made a détour, getting easier going; but though the floes were less formidable as we proceeded south, the pack grew thicker. 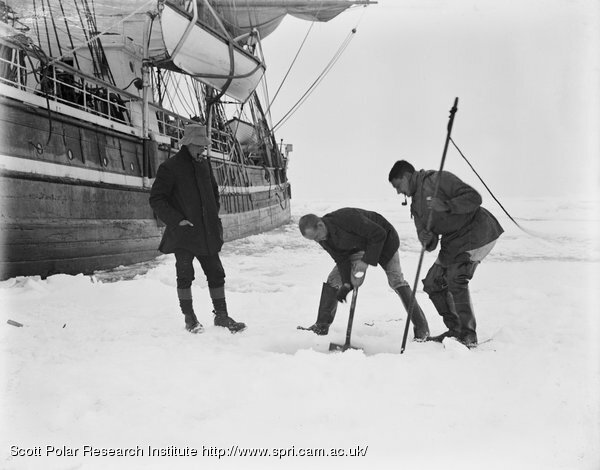 I noticed large floes of comparatively thin ice very sodden and easily split; these are similar to some we went through in the Discovery, but tougher by a month. At three we stopped and shot four crab-eater seals; to-night we had the livers for dinner–they were excellent. To-night we are in very close pack–it is doubtful if it is worth pushing on, but an arch of clear sky which has shown to the southward all day makes me think that there must be clearer water in that direction; perhaps only some 20 miles away–but 20 miles is much under present conditions. As I came below to bed at 11 P.M. Bruce was slogging away, making fair progress, but now and again brought up altogether. I noticed the ice was becoming much smoother and thinner, with occasional signs of pressure, between which the ice was very thin. ‘We had been very carefully into all the evidence of former voyages to pick the best meridian to go south on, and I thought and still think that the evidence points to the 178 W. as the best. We entered the pack more or less on this meridian, and have been rewarded by encountering worse conditions than any ship has had before. Worse, in fact, than I imagined would have been possible on any other meridian of those from which we could have chosen. ‘To understand the difficulty of the position you must appreciate what the pack is and how little is known of its movements. 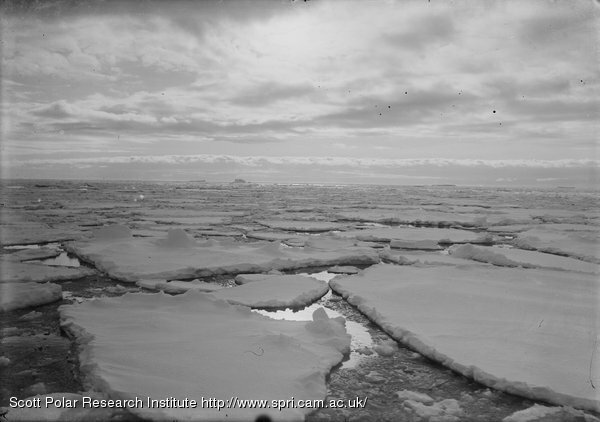 ‘The pack in this part of the world consists (1) of the ice which has formed over the sea on the fringe of the Antarctic continent during the last winter; (2) of very heavy old ice floes which have broken out of bays and inlets during the previous summer, but have not had time to get north before the winter set in; (3) of comparatively heavy ice formed over the Ross Sea early in the last winter; and (4) of comparatively thin ice which has formed over parts of the Ross Sea in middle or towards the end of the last winter. ‘Undoubtedly throughout the winter all ice-sheets move and twist, tear apart and press up into ridges, and thousands of bergs charge through these sheets, raising hummocks and lines of pressure and mixing things up; then of course where such rents are made in the winter the sea freezes again, forming a newer and thinner sheet. ‘With the coming of summer the northern edge of the sheet decays and the heavy ocean swell penetrates it, gradually breaking it into smaller and smaller fragments. Then the whole body moves to the north and the swell of the Ross Sea attacks the southern edge of the pack. ‘This makes it clear why at the northern and southern limits the pieces or ice-floes are comparatively small, whilst in the middle the floes may be two or three miles across; and why the pack may and does consist of various natures of ice-floes in extraordinary confusion. ‘Further it will be understood why the belt grows narrower and the floes thinner and smaller as the summer advances. ‘We know that where thick pack may be found early in January, open water and a clear sea may be found in February, and broadly that the later the date the easier the chance of getting through. ‘A ship going through the pack must either break through the floes, push them aside, or go round them, observing that she cannot push floes which are more than 200 or 300 yards across. ‘Whether a ship can get through or not depends on the thickness and nature of the ice, the size of the floes and the closeness with which they are packed together, as well as on her own power. ‘The situation of the main bodies of pack and the closeness with which the floes are packed depend almost entirely on the prevailing winds. One cannot tell what winds have prevailed before one’s arrival; therefore one cannot know much about the situation or density. ‘Within limits the density is changing from day to day and even from hour to hour; such changes depend on the wind, but it may not necessarily be a local wind, so that at times they seem almost mysterious. One sees the floes pressing closely against one another at a given time, and an hour or two afterwards a gap of a foot or more may be seen between each. 65° 8′. 177° 41′. Made good S. 4 W. 109′; Scott Island S. 22 W. 147′. 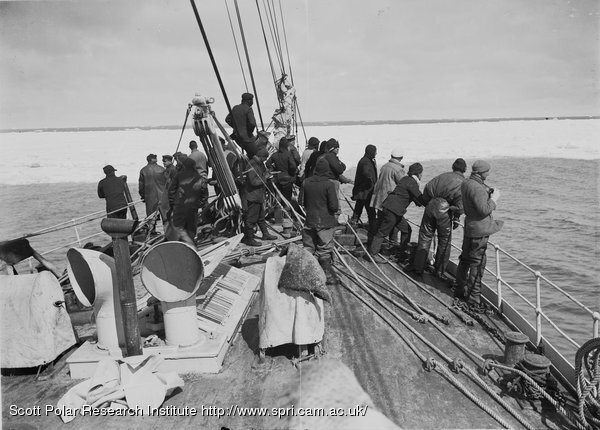 At six this morning bergs and pack were reported ahead; at first we thought the pack might consist only of fragments of the bergs, but on entering a stream we found small worn floes–the ice not more than two or three feet in thickness. 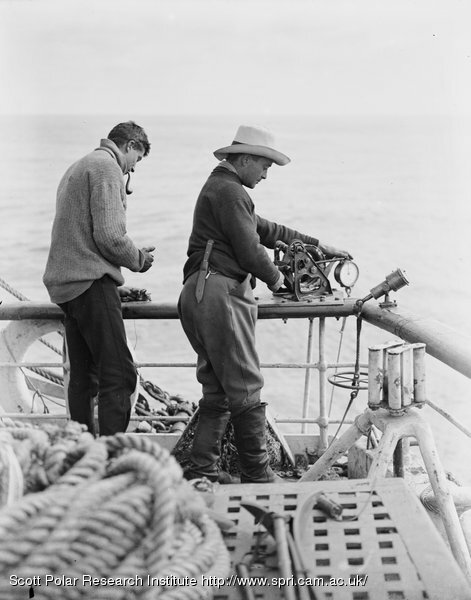 ‘I had hoped that we should not meet it till we reached latitude 66 1/2 or at least 66.’ We decided to work to the south and west as far as the open water would allow, and have met with some success. At 4 P.M., as I write, we are still in open water, having kept a fairly straight course and come through five or six light streams of ice, none more than 300 yards across. We have passed some very beautiful bergs, mostly tabular. The heights have varied from 60 to 80 feet, and I am getting to think that this part of the Antarctic yields few bergs of greater altitude. Two bergs deserve some description. One, passed very close on port hand in order that it might be cinematographed, was about 80 feet in height, and tabular. It seemed to have been calved at a comparatively recent date. Straight strata of hard white névé with ‘intrusions’ of blue ice. Twisted strata of blue ice. The above picture shows its peculiarities, and points to the desirability of close examination of other berg faces. There seemed to be a distinct difference of origin between the upper and lower portions of the berg, as though a land glacier had been covered by layer after layer of seasonal snow. Then again, what I have described as ‘intrusive layers of blue ice’ was a remarkable feature; one could imagine that these layers represent surfaces which have been transformed by regelation under hot sun and wind. The second berg was distinguished by innumerable vertical cracks. These seemed to run criss-cross and to weaken the structure, so that the various séracs formed by them had bent to different angles and shapes, giving a very irregular surface to the berg, and a face scarred with immense vertical fissures. 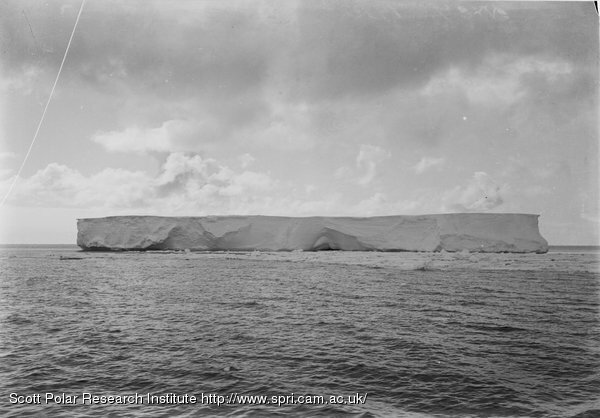 One imagines that such a berg has come from a region of ice disturbance such as King Edward’s Land. We have seen a good many whales to-day, rorquals with high black spouts – Balænoptera Sibbaldi. The birds with us: Antarctic and snow petrel – a fulmar – and this morning Cape pigeon. We have pack ice farther north than expected, and it’s impossible to interpret the fact. One hopes that we shall not have anything heavy, but I’m afraid there’s not much to build upon. 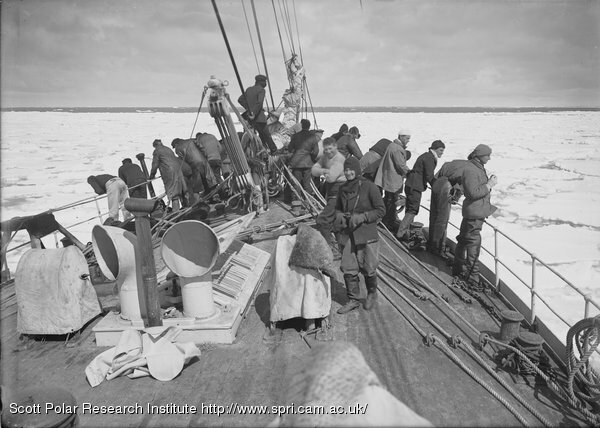 10 P.M. – We have made good progress throughout the day, but the ice streams thicken as we advance, and on either side of us the pack now appears in considerable fields. We still pass quantities of bergs, perhaps nearly one-half the number tabular, but the rest worn and fantastic. The sky has been wonderful, with every form of cloud in every condition of light and shade; the sun has continually appeared through breaks in the cloudy heavens from time to time, brilliantly illuminating some field of pack, some steep-walled berg, or some patch of bluest sea. So sunlight and shadow have chased each other across our scene. To-night there is little or no swell–the ship is on an even keel, steady, save for the occasional shocks on striking ice. It is difficult to express the sense of relief this steadiness gives after our storm-tossed passage. One can only imagine the relief and comfort afforded to the ponies, but the dogs are visibly cheered and the human element is full of gaiety. The voyage seems full of promise in spite of the imminence of delay. If the pack becomes thick I shall certainly put the fires out and wait for it to open. I do not think it ought to remain close for long in this meridian. To-night we must be beyond the 66th parallel. 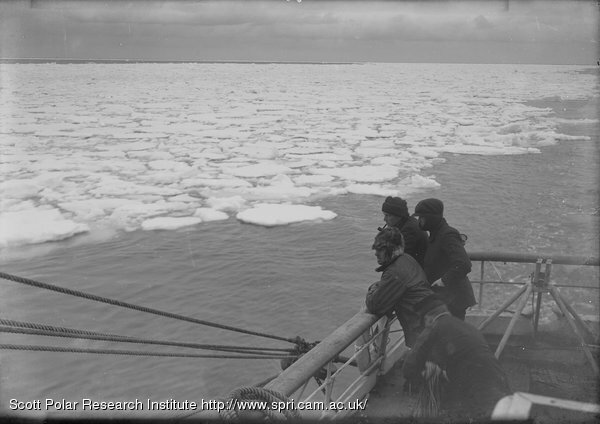 Later, about 7 P.M. Evans saw two icebergs far on the port beam; they could only be seen from the masthead. Whales have been frequently seen – Balænoptera Sibbaldi– supposed to be the biggest mammal that has ever existed. 63° 20′. 177° 22′. S. 31 E. 138′; to Circle 191′. The wind increased in the first watch last night to a moderate gale. The ship close hauled held within two points of her course. Topgallant sails and mainsail were furled, and later in the night the wind gradually crept ahead. At 6 A.M. we were obliged to furl everything, and throughout the day we have been plunging against a stiff breeze and moderate sea. This afternoon by keeping a little to eastward of the course, we have managed to get fore and aft sail filled. The barometer has continued its steady upward path for twenty-four hours; it shows signs of turning, having reached within 1/10th of 30 inches. It was light throughout last night (always a cheerful condition), but this head wind is trying to the patience, more especially as our coal expenditure is more than I estimated. We manage 62 or 63 revolutions on about 9 tons, but have to distil every three days at expense of half a ton, and then there is a weekly half ton for the cook. It is certainly a case of fighting one’s way South. I was much disturbed last night by the motion; the ship was pitching and twisting with short sharp movements on a confused sea, and with every plunge my thoughts flew to our poor ponies. This afternoon they are fairly well, but one knows that they must be getting weaker as time goes on, and one longs to give them a good sound rest with the ship on an even keel. Poor patient beasts! One wonders how far the memory of such fearful discomfort will remain with them–animals so often remember places and conditions where they have encountered difficulties or hurt. Do they only recollect circumstances which are deeply impressed by some shock of fear or sudden pain, and does the remembrance of prolonged strain pass away? Who can tell? But it would seem strangely merciful if nature should blot out these weeks of slow but inevitable torture. The dogs are in great form again; for them the greatest circumstance of discomfort is to be constantly wet. It was this circumstance prolonged throughout the gale which nearly lost us our splendid leader ‘Osman.’ In the morning he was discovered utterly exhausted and only feebly trembling; life was very nearly out of him. He was buried in hay, and lay so for twenty-four hours, refusing food–the wonderful hardihood of his species was again shown by the fact that within another twenty-four hours he was to all appearance as fit as ever. Antarctic petrels have come about us. This afternoon one was caught. First Ice. – There was a report of ice at dinner to-night. 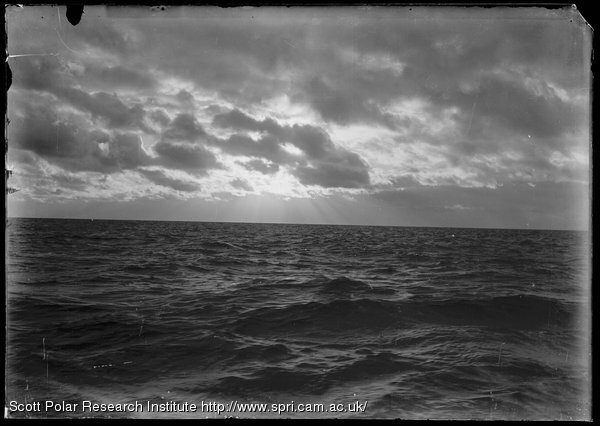 Evans corroborated Cheetham’s statement that there was a berg far away to the west, showing now and again as the sun burst through the clouds. Lat. 61° 22′. Long. 179° 56′ W. Made good S. 25 E. 150; Ant. Circle 313′. The barometer descended on a steep regular gradient all night, turning suddenly to an equally steep up grade this morning. With the turn a smart breeze sprang up from the S.W. and forced us three points off our course. The sea has remained calm, seeming to show that the ice is not far off; this afternoon temperature of air and water both 34°, supporting the assumption. The wind has come fair and we are on our course again, going between 7 and 8 knots. 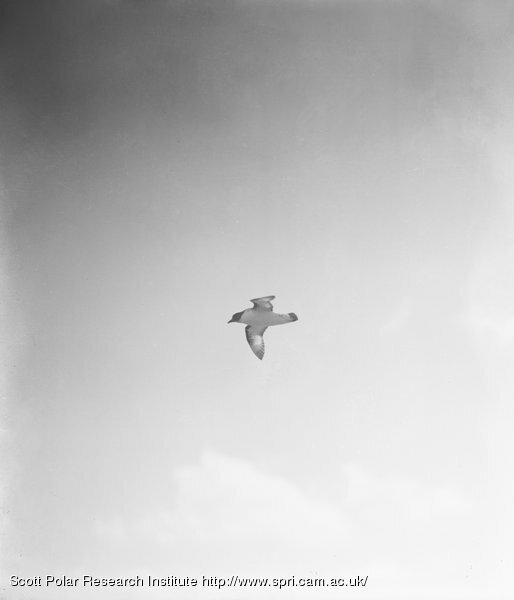 Quantities of whale birds about the ship, the first fulmars and the first McCormick skua seen. Last night saw ‘hour glass’ dolphins about. 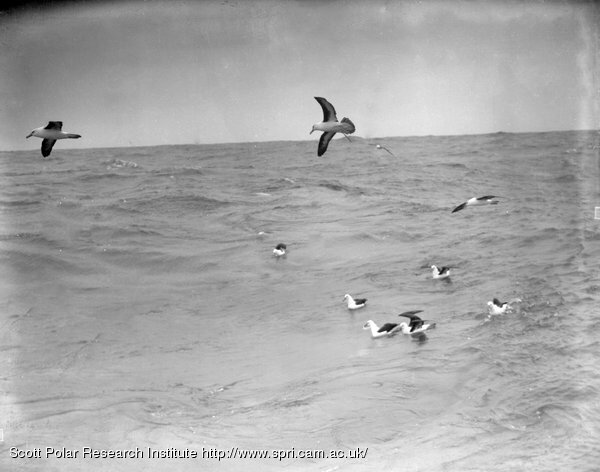 Sooty and black-browed albatrosses continue, with Cape chickens. The cold makes people hungry and one gets just a tremor on seeing the marvellous disappearance of consumables when our twenty-four young appetites have to be appeased. Last night I discussed the Western Geological Party, and explained to Ponting the desirability of his going with it. I had thought he ought to be in charge, as the oldest and most experienced traveller, and mentioned it to him–then to Griffith Taylor. The latter was evidently deeply disappointed. So we three talked the matter out between us, and Ponting at once disclaimed any right, and announced cheerful agreement with Taylor’s leadership; it was a satisfactory arrangement, and shows Ponting in a very pleasant light. I’m sure he’s a very nice fellow. I would record here a symptom of the spirit which actuates the men. After the gale the main deck under the forecastle space in which the ponies are stabled leaked badly, and the dirt of the stable leaked through on hammocks and bedding. Not a word has been said; the men living in that part have done their best to fend off the nuisance with oilskins and canvas, but without sign of complaint. Indeed the discomfort throughout the mess deck has been extreme. Everything has been thrown about, water has found its way down in a dozen places. There is no daylight, and air can come only through the small fore hatch; the artificial lamplight has given much trouble. 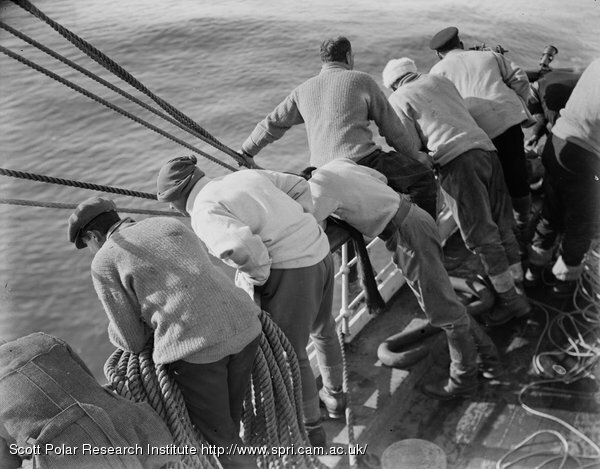 The men have been wetted to the skin repeatedly on deck, and have no chance of drying their clothing. All things considered, their cheerful fortitude is little short of wonderful. Lat. 59° 7′. Long. 177° 51′ E. Made good S. 17 E. 153; 457′ to Circle. The promise of yesterday has been fulfilled, the swell has continued to subside, and this afternoon we go so steadily that we have much comfort. I am truly thankful mainly for the sake of the ponies; poor things, they look thin and scraggy enough, but generally brighter and fitter. There is no doubt the forecastle is a bad place for them, but in any case some must have gone there. The four midship ponies, which were expected to be subject to the worst conditions, have had a much better time than their fellows. A few ponies have swollen legs, but all are feeding well. The wind failed in the morning watch and later a faint breeze came from the eastward; the barometer has been falling, but not on a steep gradient; it is still above normal. This afternoon it is overcast with a Scotch mist. Another day ought to put us beyond the reach of westerly gales. We still continue to discuss the project of landing at Cape Crozier, and the prospect grows more fascinating as we realise it. For instance, we ought from such a base to get an excellent idea of the Barrier movement, and of the relative movement amongst the pressure ridges. There is no doubt it would be a tremendous stroke of luck to get safely landed there with all our paraphernalia. 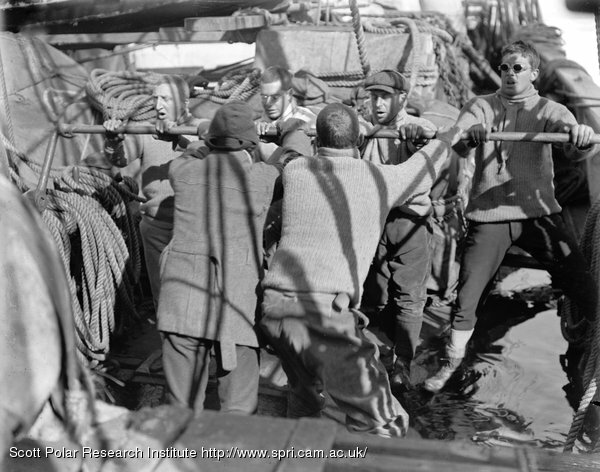 Everyone is very cheerful – one hears laughter and song all day – it’s delightful to be with such a merry crew. A week from New Zealand to-day. Lat. 56° 40′. The barometer has been almost steady since Saturday, the wind rising and falling slightly, but steady in direction from the west. From a point off course we have crept up to the course itself. Everything looks prosperous except the ponies. 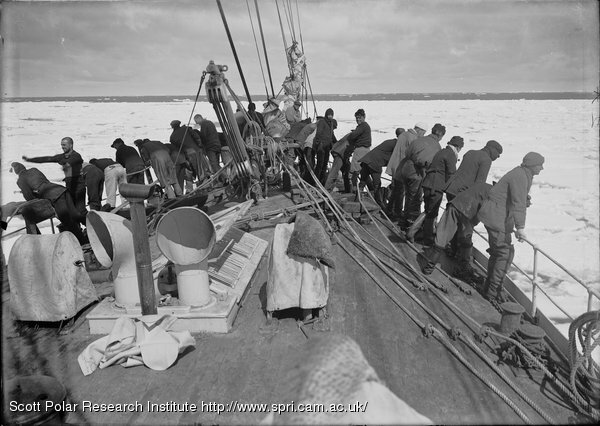 Up to this morning, in spite of favourable wind and sea, the ship has been pitching heavily to a south-westerly swell. This has tried the animals badly, especially those under the forecastle. We had thought the ponies on the port side to be pretty safe, but two of them seem to me to be groggy, and I doubt if they could stand more heavy weather without a spell of rest. I pray there may be no more gales. We should be nearing the limits of the westerlies, but one cannot be sure for at least two days. There is still a swell from the S.W., though it is not nearly so heavy as yesterday, but I devoutly wish it would vanish altogether. So much depends on fine weather. 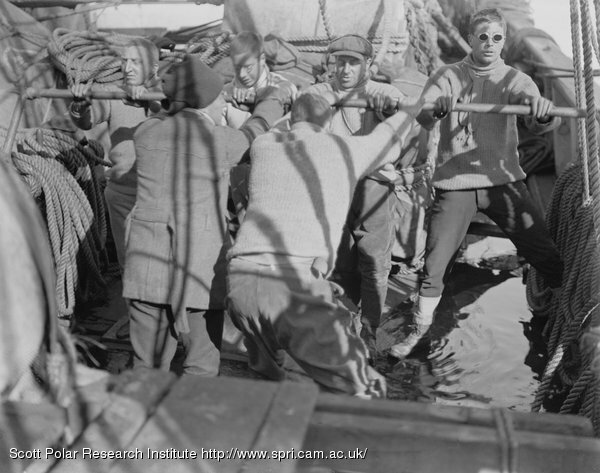 December ought to be a fine month in the Ross Sea; it always has been, and just now conditions point to fine weather. Well, we must be prepared for anything, but I’m anxious, anxious about these animals of ours. The dogs have quite recovered since the fine weather – they are quite in good form again. Our deck cargo is getting reduced; all the coal is off the upper deck and the petrol is re-stored in better fashion; as far as that is concerned we should not mind another blow. Campbell and Bowers have been untiring in getting things straight on deck. The idea of making our station Cape Crozier has again come on the tapis. There would be many advantages: the ease of getting there at an early date, the fact that none of the autumn or summer parties could be cut off, the fact that the main Barrier could be reached without crossing crevasses and that the track to the Pole would be due south from the first:–the mild condition and absence of blizzards at the penguin rookery, the opportunity of studying the Emperor penguin incubation, and the new interest of the geology of Terror, besides minor facilities, such as the getting of ice, stones for shelters, &c. The disadvantages mainly consist in the possible difficulty of landing stores–a swell would make things very unpleasant, and might possibly prevent the landing of the horses and motors. Then again it would be certain that some distance of bare rock would have to be traversed before a good snow surface was reached from the hut, and possibly a climb of 300 or 400 feet would intervene. 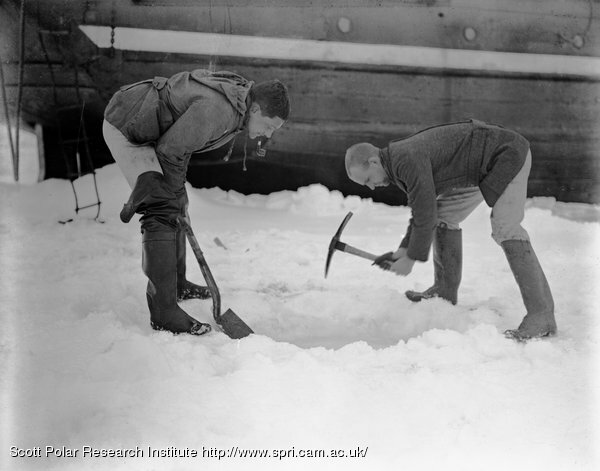 Again, it might be difficult to handle the ship whilst stores were being landed, owing to current, bergs, and floe ice. It remains to be seen, but the prospect is certainly alluring. At a pinch we could land the ponies in McMurdo Sound and let them walk round. The sun is shining brightly this afternoon, everything is drying, and I think the swell continues to subside. Yesterday the wind slowly fell towards evening; less water was taken on board, therefore less found its way below, and it soon became evident that our baling was gaining on the engine-room. The work was steadily kept going in two-hour shifts. By 10 P.M. the hole in the engine-room bulkhead was completed, and (Lieut.) Evans, wriggling over the coal, found his way to the pump shaft and down it. He soon cleared the suction ‘of the coal balls (a mixture of coal and oil) which choked it,’ and to the joy of all a good stream of water came from the pump for the first time. From this moment it was evident we should get over the difficulty, and though the pump choked again on several occasions the water in the engine-room steadily decreased. It was good to visit that spot this morning and to find that the water no longer swished from side to side. In the forenoon fires were laid and lighted – the hand pump was got into complete order and sucked the bilges almost dry, so that great quantities of coal and ashes could be taken out. 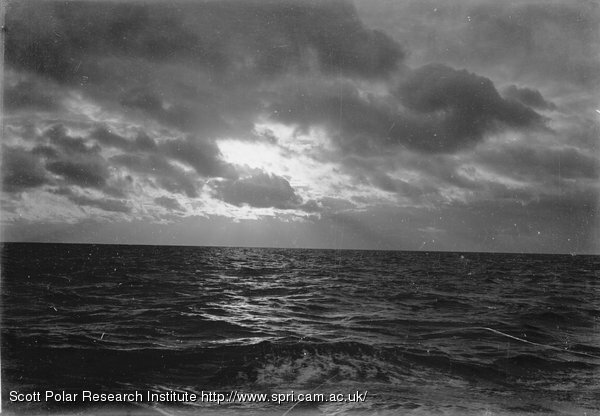 Now all is well again, and we are steaming and sailing steadily south within two points of our course. Campbell and Bowers have been busy relisting everything on the upper deck. This afternoon we got out the two dead ponies through the forecastle skylight. It was a curious proceeding, as the space looked quite inadequate for their passage. We looked into the ice-house and found it in the best order. Though we are not yet safe, as another gale might have disastrous results, it is wonderful to realise the change which has been wrought in our outlook in twenty-four hours. The others have confessed the gravely serious view of our position which they shared with me yesterday, and now we are all hopeful again. As far as one can gather, besides the damage to the bulwarks of the ship, we have lost two ponies, one dog, ’10 tons of coal,’ 65 gallons of petrol, and a case of the biologists’ spirit – a serious loss enough, but much less than I expected. ‘All things considered we have come off lightly, but it was bad luck to strike a gale at such a time.’ The third pony which was down in a sling for some time in the gale is again on his feet. He looks a little groggy, but may pull through if we don’t have another gale. Osman, our best sledge dog, was very bad this morning, but has been lying warmly in hay all day, and is now much better. 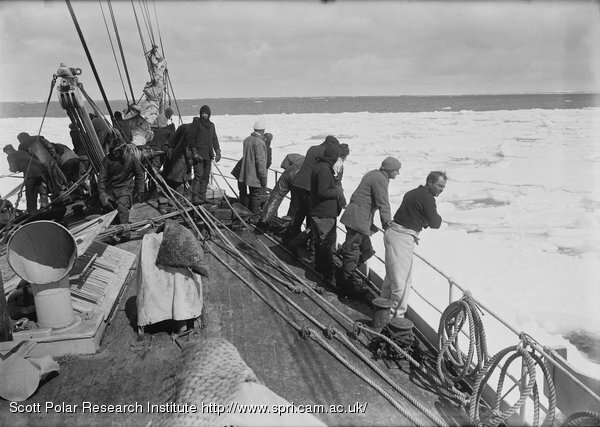 ‘Several more were in a very bad way and needed nursing back to life.’ The sea and wind seem to be increasing again, and there is a heavy southerly swell, but the glass is high; we ought not to have another gale till it falls. The night wore on, the sea and wind ever rising, and the ship ever plunging more distractedly; we shortened sail to main topsail and staysail, stopped engines and hove to, but to little purpose. Tales of ponies down came frequently from forward, where Oates and Atkinson laboured through the entire night. Worse was to follow, much worse – a report from the engine-room that the pumps had choked and the water risen over the gratings. From this moment, about 4 A.M., the engine-room became the centre of interest. The water gained in spite of every effort. Lashley, to his neck in rushing water, stuck gamely to the work of clearing suctions. For a time, with donkey engine and bilge pump sucking, it looked as though the water would be got under; but the hope was short-lived: five minutes of pumping invariably led to the same result – a general choking of the pumps. The outlook appeared grim. The amount of water which was being made, with the ship so roughly handled, was most uncertain. ‘We knew that normally the ship was not making much water, but we also knew that a considerable part of the water washing over the upper deck must be finding its way below; the decks were leaking in streams. The ship was very deeply laden; it did not need the addition of much water to get her water-logged, in which condition anything might have happened.’ The hand pump produced only a dribble, and its suction could not be got at; as the water crept higher it got in contact with the boiler and grew warmer – so hot at last that no one could work at the suctions. Williams had to confess he was beaten and must draw fires. What was to be done? Things for the moment appeared very black. The sea seemed higher than ever; it came over lee rail and poop, a rush of green water; the ship wallowed in it; a great piece of the bulwark carried clean away. The bilge pump is dependent on the main engine. To use the pump it was necessary to go ahead. It was at such times that the heaviest seas swept in over the lee rail; over and over [again] the rail, from the forerigging to the main, was covered by a solid sheet of curling water which swept aft and high on the poop. On one occasion I was waist deep when standing on the rail of the poop. The scene on deck was devastating, and in the engine-room the water, though really not great in quantity, rushed over the floor plates and frames in a fashion that gave it a fearful significance. 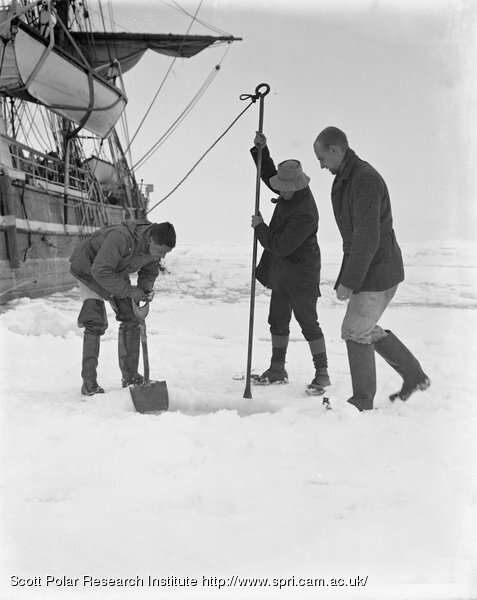 The afterguard were organised in two parties by Evans to work buckets; the men were kept steadily going on the choked hand pumps – this seemed all that could be done for the moment, and what a measure to count as the sole safeguard of the ship from sinking, practically an attempt to bale her out! Yet strange as it may seem the effort has not been wholly fruitless – the string of buckets which has now been kept going for four hours, together with the dribble from the pump, has kept the water under – if anything there is a small decrease. Meanwhile we have been thinking of a way to get at the suction of the pump: a hole is being made in the engine-room bulkhead, the coal between this and the pump shaft will be removed, and a hole made in the shaft. With so much water coming on board, it is impossible to open the hatch over the shaft. We are not out of the wood, but hope dawns, as indeed it should for me, when I find myself so wonderfully served. Officers and men are singing chanties over their arduous work. Williams is working in sweltering heat behind the boiler to get the door made in the bulkhead. Not a single one has lost his good spirits. A dog was drowned last night, one pony is dead and two others in a bad condition – probably they too will go. ‘Occasionally a heavy sea would bear one of them away, and he was only saved by his chain. Meares with some helpers had constantly to be rescuing these wretched creatures from hanging, and trying to find them better shelter, an almost hopeless task. One poor beast was found hanging when dead; one was washed away with such force that his chain broke and he disappeared overboard; the next wave miraculously washed him on board again and he is now fit and well.’ The gale has exacted heavy toll, but I feel all will be well if we can only cope with the water. Another dog has just been washed overboard – alas! Thank God, the gale is abating. The sea is still mountainously high, but the ship is not labouring so heavily as she was. I pray we may be under sail again before morning.